As gatekeepers, judges ensure that fact-finders are only exposed to sensible matters. However the landmark U.S. Supreme Court case, Ashcroft v. Iqbal, puts federal judges beyond the role of gatekeepers. Now federal cases may survive based on that which presiding judges find sensible or plausible as opposed to the sensibilities of a broader community of stakeholders. Nothing could be more precarious in such an environment than venturing to prove judicial misconduct through Title 42 U.S.C. section 1983 and / or Bivens litigation. 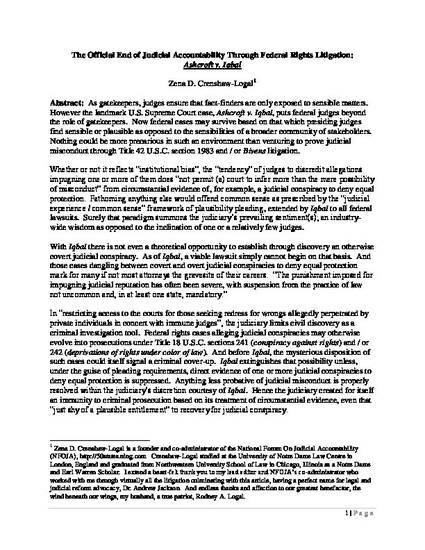 Whether or not it reflects “institutional bias”, the “tendency” of judges to discredit allegations impugning one or more of them does “not permit (a) court to infer more than the mere possibility of misconduct” from circumstantial evidence of, for example, a judicial conspiracy to deny equal protection. Fathoming anything else would offend common sense as prescribed by the “judicial experience / common sense” framework of plausibility pleading, extended by Iqbal to all federal lawsuits. Surely that paradigm summons the judiciary’s prevailing sentiment(s); an industry-wide wisdom as opposed to the inclination of one or a relatively few judges. With Iqbal there is not even a theoretical opportunity to establish through discovery an otherwise covert judicial conspiracy. As of Iqbal, a viable lawsuit simply cannot begin on that basis. And those cases dangling between covert and overt judicial conspiracies to deny equal protection mark for many if not most attorneys the gravesite of their careers. “The punishment imposed for impugning judicial reputation has often been severe, with suspension from the practice of law not uncommon and, in at least one state, mandatory.” In “restricting access to the courts for those seeking redress for wrongs allegedly perpetrated by private individuals in concert with immune judges”, the judiciary limits civil discovery as a criminal investigation tool. Federal rights cases alleging judicial conspiracies may otherwise evolve into prosecutions under Title 18 U.S.C. sections 241 (conspiracy against rights) and / or 242 (deprivations of rights under color of law). And before Iqbal, the mysterious disposition of such cases could itself signal a criminal cover-up. Iqbal extinguishes that possibility unless, under the guise of pleading requirements, direct evidence of one or more judicial conspiracies to deny equal protection is suppressed. Anything less probative of judicial misconduct is properly resolved within the judiciary’s discretion courtesy of Iqbal. Hence the judiciary created for itself an immunity to criminal prosecution based on its treatment of circumstantial evidence, even that “just shy of a plausible entitlement” to recovery for judicial conspiracy. Zena Denise Crenshaw-Logal. “The Official End of Judicial Accountability Through Federal Rights Litigation: Ashcroft v. Iqbal”, 35 Am. J. Trial Advoc. 125 (Summer 2011).